Guatemalan President Jimmy Morales’ arbitrary decision to not renew the mandate of the United Nations-backed International Commission Against Impunity in Guatemala (CICIG) and to block its lead investigator, Ivan Velásquez, from the country has provoked a response from citizens across Guatemala. The situation has become a constitutional crisis as Morales has willingly ignored the highest court’s orders to permit the return of Velásquez, utilizing his speech at the United Nations to criticize the U.N.’s anti-impunity efforts. A broad coalition of social movements, Indigenous Ancestral Authorities, student groups, members of the LGBTIQ community, and campesino organizations have mobilized to reject Morales’ decision to end the CICIG and show their support for the body. Since Morales’ announcement on August 31, the coalition has carried out nearly weekly protests, including blocking highways and protesting in the central plaza and outside the country’s congressional building. Mobilizations began on September 10 with the Indigenous Municipality of Sololá organizing roadblocks along the Interamerican Highway, which passes through the department, in support of Velásquez and the CICIG. For six hours, tens of thousands of residents of the 83 villages and towns that make up the municipality blocked traffic along the highway. The following day, on September 11, student groups from the University of San Carlos (USAC), members of campesino organizations, and anti-corruption efforts mobilized outside of the Guatemalan congress to reject Morales’ decision and to protest a series of reforms that would undo anti-corruption efforts in the country. The situation grew tense as police pushed back protesters to permit a congressional member to leave the building, and protesters responded by throwing bananas, water, and flowers at him. That same day the Indigenous Ancestral Government of the 48 Cantones of Totonicapán, the autonomous government of the communities within the municipality of Totonicapán, blocked the Interamerican Highway in protest of Morales. On September 12, members of the Comité de Desarrollo Campesino (Campesino Development Committee, CODECA) organized a march that converged in the central plaza. Thousands from diverse organizations, including CODECA and other campesino organizations, LGBTIQ community members, and religious groups, mobilized to show their disdain with the administration and show their support for the CICIG. Morales, who promised voters in 2015 that he was “not corrupt nor a thief” (ni corupto ni ladrón), has faced investigations into the illegal financing of his 2015 campaign, as well as allegations of sexual assault within the administration. Morales was elected after the political crisis and subsequent protests following the CICIG’s investigations into the administration of Otto Pérez Molina, which eventually led to the resignation of Pérez Molina, his Vice President Roxana Baldetti, and the majority of his cabinet. Pérez Molina and Baldetti currently face prosecution for corruption. As organizations gathered in the Central Plaza, the Guatemalan government sent in hundreds of police officers and deployed military special forces, known as Kaibiles, to Guatemala City to block the streets around Congress. The deployment of soldiers violates the 1996 peace accords, which sought to demilitarize the country by limiting the military’s presence to the country’s borders. An army spokesperson claimed that the Kaibiles’ presence was necessary because Morales was in the congressional building and needed protection. But their appearance generated fear and anger in the streets. The week of protests culminated on September 14 when a group of over 100 current students and alumni from the University of San Carlos marched alongside various marching bands in the flag raising ceremony in commemoration of the 197th anniversary of Guatemala’s independence from Spain. As Morales presided over the commemoration of the country’s independence, members of group USAC is the People drowned out the message with shouts against Morales and corruption. On September 20, thousands of students from Guatemala’s universities called for a day of nationwide action and marched through Guatemala City. Similar demonstrations were held in Quetzaltenango and along rural highways such as the highway that passes through the Ixil region of Quiche. On September 16, Guatemala’s Constitutional Congress ruled against the administration and issued a decision to permit Velásquez’s re-entry into the country. The Morales administration has rejected the court’s decision, but the Guatemalan military announced that it would comply with the decision after the court rejected the Ministry of Defense’s appeal of the decision. Faced with the continuation of the crisis and Morales’ unwillingness to comply with the highest courts orders, organizers are planning to continue actions into October with at least one major march planned. The impacts of corruption are felt across the country. These impacts are especially in the rural communities where residents face little access to quality education, health care, and development projects, or even repairs to highways. 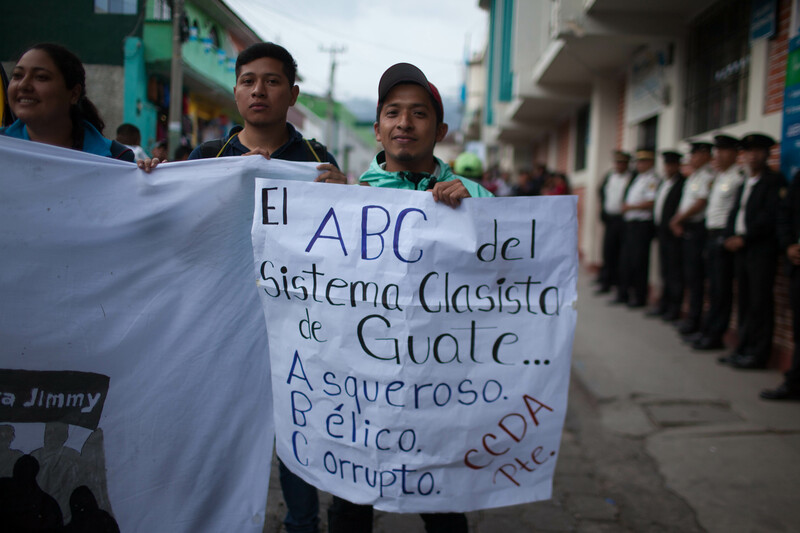 A man from Sololá holds a sign demanding the renewal of the CICIG mandate, which is set to end on September 3, 2019. Tens of thousands blocked the Interamerican highway on September 10 to show their support for the CICIG and its lead investigator, Ivan Velásquez. A man waits in his car at the roadblock in Sololá on September 10. Students from the University of San Carlos demonstrate outside of Congress on September 11. Police hold protesters back as a vehicle carrying a congressional member leaves the parking lot on September 11. Hundreds of police, anti-riot police and Kaibiles block the road that passes congress on September 12. Over a thousand members of CODECA and other organizations protest in Guatemala’s Central Plaza on September 12. Students from the University of San Carlos chant against Morales during the “cry of independence” ceremonies. A protester holds a sign comparing Morales to a clown outside the Guatemalan Constitutional Court on September 16. Hundreds associated with the Comité de Unidad Campesina (Campesino Unity Committee, CUC) in the department of Quiche march to the departmental capital of Santa Cruz del Quiche on September 20 as part of the day of national action. A man carries a sign demanding the resignation of Morales and other corrupt officials in the Central Park of Santa Cruz del Quiche on September 20. A man in Sololá holds a sign outside of the governmental building in Sololá on September 20. Jeff Abbott is an independent journalist currently based out of Guatemala. His work has appeared at The Progressive, In These Times, and Al Jazeera English. Follow him on Twitter @palabrasdeabajo. Late last month, president Jimmy Morales announced the end of the mandate of Guatemala’s International Commission Against Impunity. But Guatemalans have not taken this anti-democratic decision lying down.